Criminal investigations against former Armenian officials are in the full sway. While the main issue on the domestic agenda is economic reforms, foreign policy focuses on cooperation with Russia in different spheres. Officials from the Armenian National Security Service (NSS) confirmed on February 21 that a cash settlement of $18.5 million was transferred to the state from the frozen bank account of Aleksandr “Sashik” Sarkisian, the brother of former President Serzh Sarkisian. This was the result of negotiations conducted since his indictment on fraud charges which stem from an anti-corruption investigation. Sarkisian has also agreed to pay another $11.5 million to settle an outstanding tax debt. While neither payment will impact the pending charges against him, it may help with the judicial consideration of his possible sentence if convicted. After three days of debate, the Armenian parliament formally ratified the government’s five-year program by a vote of 88 against 40 on February 14. Although the pro-government “My Step” party of Prime Minister Nikol Pashinyan holds an overwhelming majority of seats, the opposition 18-seat “Bright Armenia” party, a former “Yelk” (“Exit”) coalition partner of Pashinyan in the previous parliament, criticized the seventy-page program during the debate as being “too vague” and lacking “concrete socioeconomic targets”. 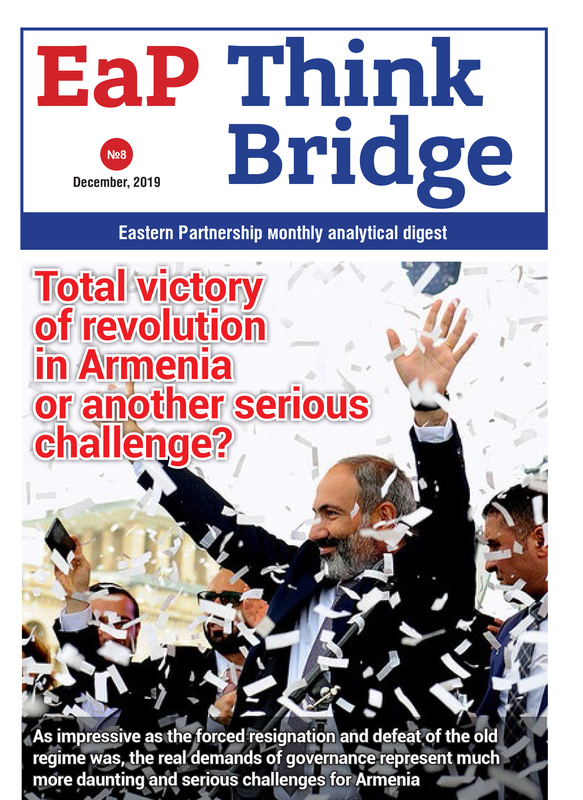 The second largest party, “Prosperous Armenia,” also joined in the criticism, although with only 26 MPs in the 132-seat parliament, was never able to defeat the program. The criticism triggered an emotional rebuke from Prime Minister Pashinyan, who noted that his former “Bright Armenia” allies failed to support him when he first launched his campaign to overthrow the former Sarkisian government in March 2018. The government program is based on an underlying assumption of five percent annual growth through 2023 and seeks to spark a “popular economic revolution” that aims to create a “competitive and inclusive” Armenian economy, with added promises of significantly improving tax administration, reducing business regulations, ensuring fair competition, attracting foreign investment, and stimulating exports. It further aims to “substantially” decrease unemployment and reduce the official poverty rate of around 30% by some 12 percentage points by 2022. Former Armenian president Robert Kocharian faced new corruption-related criminal charges of bribery on February 12, beyond an earlier indictment for violating the country’s constitutional system. The new charges were brought after incriminating testimony from businesswoman Silva Hambartsumian who alleged that she was coerced to pay a $14 million bribe to then-Environment Minister Aram Harutyunian in 2008. The former minister is believed to have fled the country after an arrest warrant was issued in January. Kocharian still faces the first set of charges, which led to his arrest and detention in July, related to his ordering to forcibly disperse demonstrators on March 1-2, 2008 in which eight civilians and two policemen died. Kocharian’s son Sedrak also faces separate criminal charges over money laundering and tax evasion allegations in excess of millions of dollars. Following a successful two-week mission to Armenia, a senior delegation from the International Monetary Fund (IMF) announced on February 26 the conclusion of a “staff-level agreement” on a new $250 million loan for Armenia. According to comments by the head of the IMF mission, Hossein Samiei, in a meeting with Armenian Prime Minister Pashinyan, “the agreement is subject to approval by the IMF Executive Board, which is expected to consider it in May 2019”. But reflecting the IMF’s approval of the Armenian government’s macroeconomic policies and “ambitious” reform agenda, the “precautionary stand-by arrangement” would be disbursed in several installments over three years in order to “support the new government’s reform plans and strengthen resilience against external shocks”. The loan follows the conclusion of a previous $115 million aid package from the IMF for 2014-2017. Despite a wave of protests and the subsequent change of government, the Armenian economy posted an annual increase of 5.2% for last year, according to the official statistics released on February 20. Driven largely by improvements in the service sector, increased industrial output and most notably, a 19% expansion in financial and related services, the figure marks a decline from the 7.5% growth for 2017, mainly due to 14% decline in the mining sector and a contraction of 8.5% in agriculture. While growth in 2018 matches the official estimate of the World Bank, there is a concern by the Bank that Armenia will suffer a decrease in economic growth this year. Armenian Energy Minister Garegin Baghramian announced on February 15 that consumers would not have to fear any price rise for natural gas, allaying concerns after Russia’s Gazprom imposed a 10% increase effective as of 1 January 2019. Although the price for Armenian imports of natural gas from Russia rose from $150 to $165 per thousand cubic meters, the Armenian government was able to prevent any change in retail prices by the country’s Gazprom-owned gas distribution network, at least through 2019. Armenian Prime Minister Nikol Pashinyan issued orders to his cabinet on February 15 to more aggressively adopt measures to “stimulate the economic revolution” in Armenia. The command follows the passage of his government’s five-year program by parliament and includes a set of 15 largely economic directives to various state agencies and government ministries. As the prime minister noted, it was intended to be different from the program as specific “measures to stimulate the economic revolution”. The directives consisted of infrastructural projects which focused on the agricultural sector, including agricultural export promotion, easier and cheaper credit to small business and hiring of seasonal workers by commercial farmers, as well as measures to retrain unemployed workers and support for potential entrepreneurs in the areas of “business skills and financial literacy”. The premier also added that the government should also “review all investment proposals” submitted by both domestic and foreign investors, explaining that senior official would adopt stricter approach priorities, meeting with serious investors with a “proven track record of major entrepreneurial”. After a series of separate announcements, on February 18, Armenian Defense Minister David Tonoyan provided a detailed summary of the decision to acquire four Sukhoi Su-30SM advanced fighter aircrafts. The minister disclosed that the purchase of the four aircrafts was a part of a larger plan to procure a full squadron of 12 multi-role fighters. The costs for the aircraft remained undisclosed, on national security grounds, but other such sales were significant, suggesting that Armenia will seek yet another loan from Russia to finance the procurement. The Su-30SM is a modernized version of a heavy fighter jet commissioned in 2012 based on the Sukhoi design first developed in the late 1980s. Armenian Foreign Ministry spokeswoman Anna Naghdalian stated on 14 February that although the Armenian government “took note of the statement” by the U.S. State Department that it does not support “any engagement with Syrian military forces” or “any cooperation between Armenia and Russia for this mission”, the decision to deploy some 83 Armenian army medics, sappers and other personnel servicemen to Syria last week was solely a “humanitarian” mission. In an additional clarification, Ruben Rubinian, the chairman of the parliamentary committee on foreign relations, added on February 15 that “sending a team of specialists to Syria is very important for us because it is, first of all, aimed at ensuring the physical security of our compatriots living there and, second of all, the security of peoples living in Syria”, which represented “a purely humanitarian move”. The statements defending the deployment also followed talks between Armenian Defense Minister David Tonoyan and his Russian counterpart, Defense Minister Sergey Shoygu, to coordinate Russian logistical support for the Armenian deployment to the city of Aleppo as a part of broader Russian operations in Syria. On the first foreign visit by an Armenian parliamentary delegation, the speaker of the parliament, Ararat Mirzoyan, and a group of deputies arrived in Moscow on 24-25 February. The parliamentary delegation held meetings with Russian Federation Council Chairman Valentina Matvienko and other senior Russian legislators. In comments to reporters in Moscow, Ruben Rubinian, the chairman of the parliamentary committee on foreign relations, noted that the Armenian delegation was focusing on strategic relations with Russia, but added that “official Moscow assures that there is no tension in the Armenian-Russian relations, despite the fact that Russian state TV channels regularly broadcast anti-Armenian programs”, which he admitted was “a problem that we have to solve”. And in his address in the Russian upper house of parliament, the Federation Council, on February 27, Armenian Parliamentary Speaker Ararat Mirzoyan strongly criticized Russian MPs for participating in what he termed “anti-Armenian actions” and demonstrations in the Azerbaijani capital Baku.